Watch your accuracy soar with the Wave steno machine. The vibrant flat-panel screen clearly displays steno outlines as you write them, giving you the best kind of feedback — immediate feedback — to enable you to practice proper technique while you build speed. The phenomenal touch of this writer will speed you on your way to success. 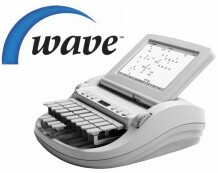 The ideal steno writer for realtime captioners – Using the same extraordinary technology as the professional Diamante steno writer, the Wave writer provides amazing results at a fraction of its cost. By eliminating redundancy yet keeping the phenomenal TrueStroke technology from the Diamante the Wave enables cleaner output than ever. I just purchased my Wave and I love it!. In the short time that I have had it, I have already noticed improved accuracy and speed.